Monday we chilled, alot. I'm finding Mondays pretty hard at the moment, going back to work & walking to pick Daniel up after a weekend off, so we spend a lot of the afternoon lazing around, watching a film. Also? 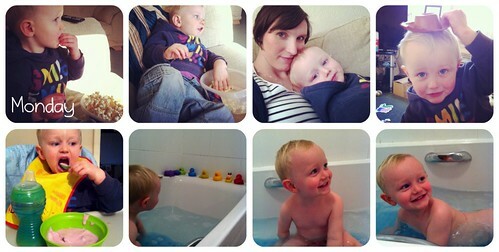 Lots of bath fun! He lined those ducks up all by himself, proud Mama moment! Tuesday we stopped at the park on the way home and I sat in the stroller watching my nearly-two-year-old navigate the slide by himself, trying not to cry. Yeah, I'm an emotional wreck. Puzzles, tickle-fights, and colander-Buzz-Lightyear-hat wearing also went down. My boys snuggled and read stories together, and I held back the tears, again.Damn you pregnancy hormones! Wednesday we went to Grandma's, and practiced jumping. Daniel was a ham at dinner. And that is all. 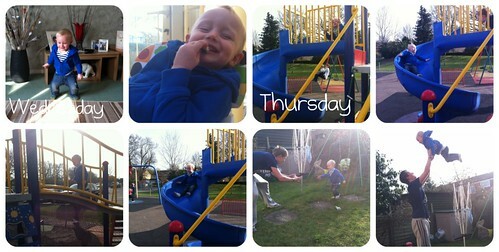 Thursday we played at the park with a friend, i.e. we chased our children around like lunatics and barely spoke. 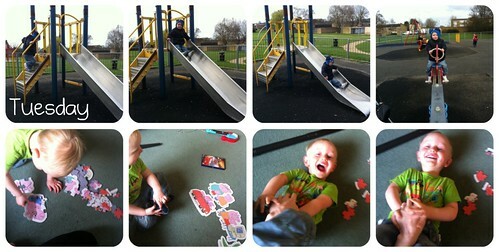 But the boys had fun, Daniel mastered the big curly slide and gave me numerous heart attacks. Oh, he also got a busted lip from falling over & a scratch in the face by a vicious little girl, poor baby! 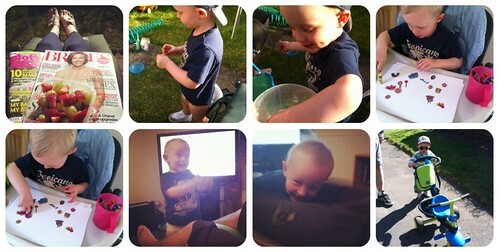 So we went home to play with Daddy in the garden & eat spaghetti, it was a good day. Friday we went to Colin's Grandad's funeral. We took Daniel because that's what we do. He looked beyond adorable in his suit 'like Daddy' & hammed it up for his audience, who appreciated the distraction. 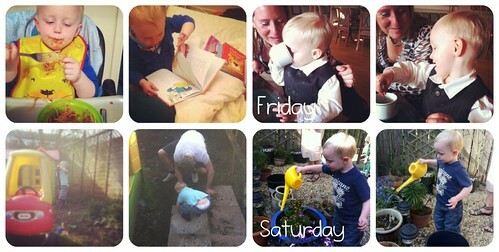 Then we went home and worked hard in the garden, because it was lovely out, again! Saturday we spent more time outside, soaking up the sun. I had a glorious two hour sunbathing session while Daniel napped, and my boy came out to join me (sans trousers) when he woke up, to blow some bubbles. Daniel had a whale of a time with some stickers Nanny bought him before dinner, and acted like a crazy child before bed. Of course. Sunday we went to the Easter Egg Hunt at school, more pictures to follow. 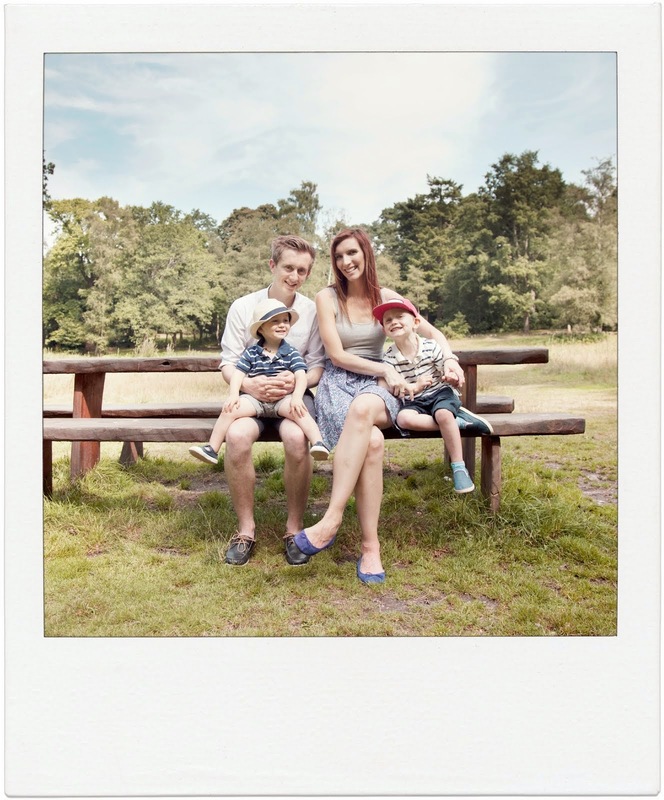 Linking up with Amy at a good life.